My top Studio Q moment of 2017 was interviewing Tony Rock about being the host of TV ONE's new show, "The Game of Dating." During my interview, I asked Tony what he thought about Steve Harvey's meeting with Donald Trump. Tony did not hold back one bit. His answer made this clip go viral! Watch below. My interview clip with Tony was viewed by over 2 million people on Facebook, by hundreds of thousands of people on Instagram, and became the headline of countless blog posts and radio show segments. It even made it into the conversation on The Breakfast Club and Dish Nation. Tony had me laughing non-stop. He was so entertaining that I think the entire interview should have went viral. If you want to get your life please press play and watch our entire conversation below! In December I sat down for a one-on-one interview with Jenifer Lewis in her wonderful home to discuss her new book, The Mother of Black Hollywood. The last time I interviewed this treasured diva was back in 2012 in the backyard of her Hollywood mansion by the pool. It was one of my best Studio Q interviews to date, so I was not sure if we could top that moment in time. But leave it to the great Jenifer Lewis to always out do herself. She always gives 2,000 % percent and this interview was no different. I had the time of my life with her and it was a great way to close out the year. This interview was so good that it served as an early Christmas present for me. We discussed her acting career, including starring on "Black-ish," being sexually assaulted, how she dealt with a scam artist, being bipolar, advice to the millennials and so many other things. She even invited me and Tam (my Producer and best friend) to sing "In These Streets" with her at the piano. The initial song went viral and was sang by Jenifer, Brandy and Roz Ryan. Watch our attempt to sing along with Jenifer Lewis. It was not pretty but it was oh so much fun! Later, scroll down to watch my amazing interview with this legend. 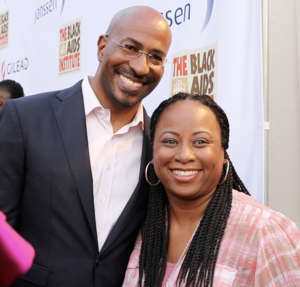 Check out my interview with Jenifer Lewis below. On Tuesday September 19, 2017 I covered the third annual fundraising gala honoring 16-time GRAMMY® Award winner David Foster, which was hosted by The GRAMMY Museum®. 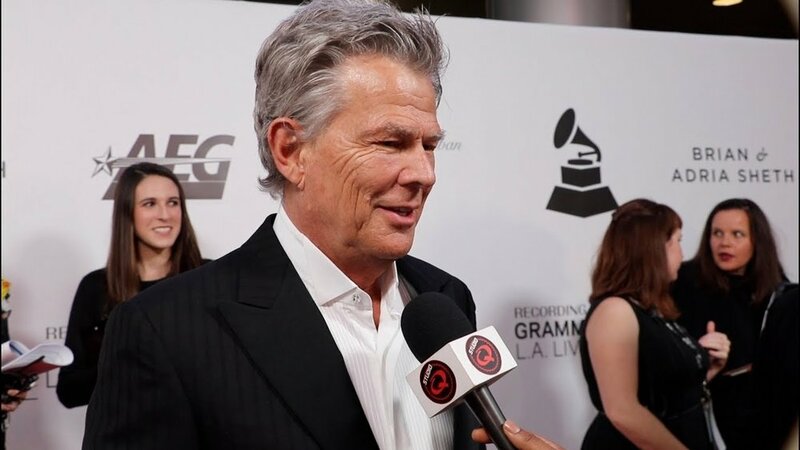 The Gala presented David Foster with the Architects of Sound Award in recognition of his unparalleled contributions to music. Proceeds from the night benefitted the Museum's newly expanded music education programs, which were integrated with those of its sister organization, the GRAMMY Foundation, earlier this year. 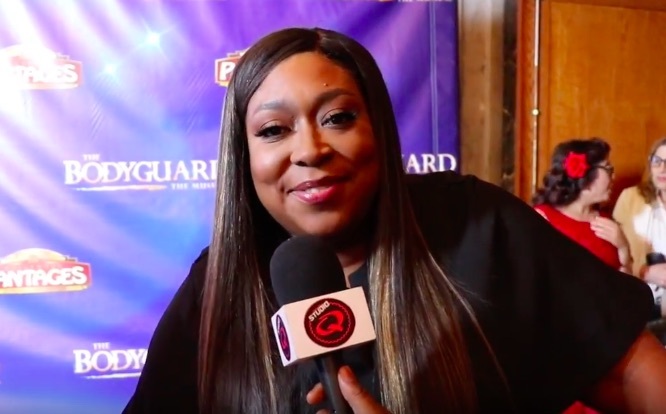 In May of 2017, I covered LA's premiere of the hit musical, THE BODYGUARD at The Hollywood Pantages theater. It is an award–winning musical based on the smash–hit film of the same name. Who could forget Kevin Coster as Frank Farmer, the former Secret Service agent turned bodyguard hired to protect superstar Rachel Marron, played by the late great Whitney Houston? It was Whitney's first film, so I was super excited to see this show and so was a lot of Hollywood! 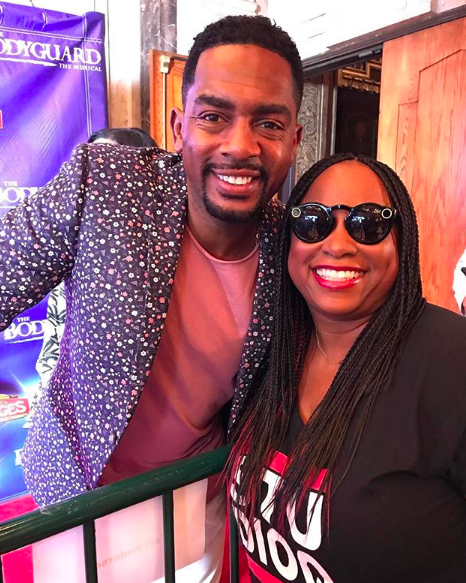 Stars who came out included, Angela Bassett, Loni Love, Erica Cash, Erica Campbell, Bill Bellamy and Loretta Devine. Grammy® Award-nominated and multi-platinum R&B/pop recording artist and film/TV actress Deborah Cox stars as Rachel Marron. In the role of the bodyguard Frank Farmer, is television star Judson Mills. I am such a huge Whitney Houston fan so I am very biased when it comes to other people singing her songs, but as soon as Deborah Cox opened her mouth - I was sold! Based on Lawrence Kasdan’s 1992 Oscar nominated Warner Bros. film, and adapted by Academy Award-winner (Birdman) Alexander Dinelaris, THE BODYGUARD featured songs recorded by Whitney Houston including: One Moment in Time, I Have Nothing, I Wanna Dance with Somebody, Saving All My Love, Run to You, So Emotional and her cover version of Dolly Parton's I Will Always Love You. What I loved most about this show is that Deborah Cox was not trying to be Whitney Houston. She made the songs her own all while celebrating Whitney at the same time. If you love Whitney Houston, then this was a MUST-SEE! 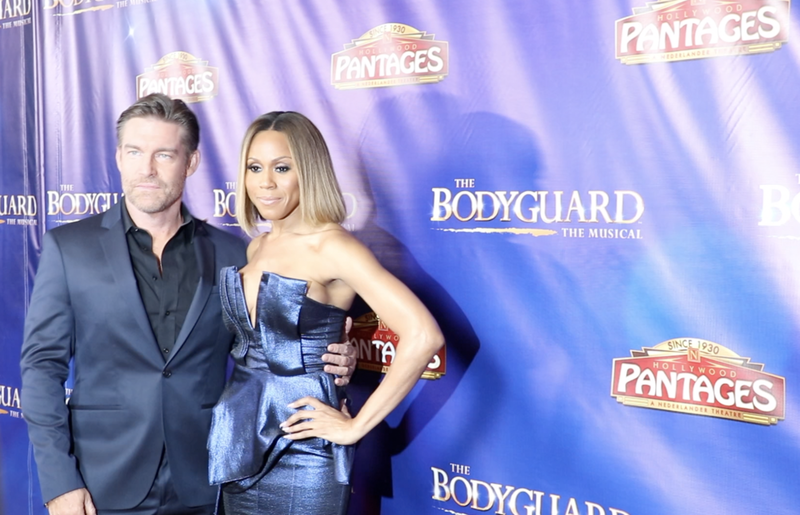 If you love the film, The Bodyguard then you are going to like how they adapted it to the stage. And if you are a Deborah Cox fan, you will be in heaven from beginning to end. You will find yourself singing along and celebrating Whitney in a positive way. Watch my red carpet interviews below. 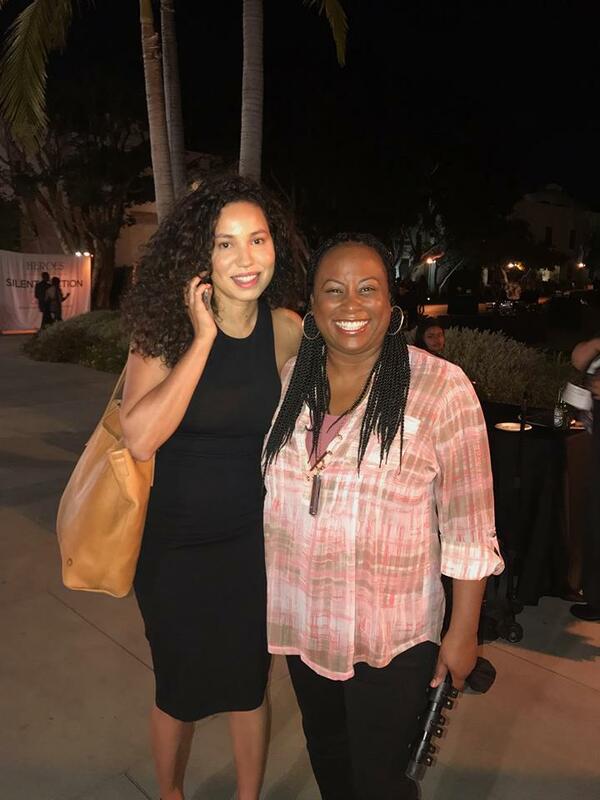 In September I covered the Heroes in the Struggle Gala Reception and Awards Presentation held at the Darryl F. Zanuck Theater at 20th Century Fox Studios in Los Angeles. 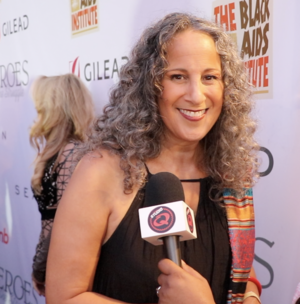 Every year the Black AIDS Institute inducts a select group of individuals and organizations that have made heroic contributions to the fight against HIV/AIDS in Black America into the Heroes in the Struggle Hall of Fame. This year's theme was "Black Men Honoring Black Women" and included Taraji P. Henson, Alfre Woodard, Laverne Cox, Vanessa Williams, Gina Belafonte, Gina Brown, and Novant Health as the Corporate Hero. 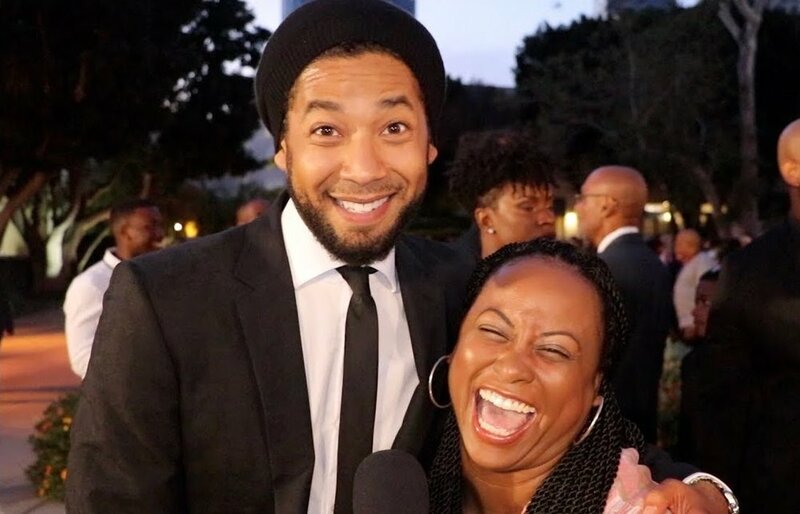 Board member and event chair, Jussie Smollett served as the evening's host and celebrated R&B singer/songwriter Ledisi who performed a special tribute. It is very clear, that 60 never looked so good. Vanessa's party was a pink and grand affair. From the candy bar to the elegant red carpet, everyone who attended had a wonderful time. Some of the attendees include: Vivica A. Fox, Tina Knowles, Star Jones, Debbie Allen, Glen Turman, Jackee' Harry, Kym Whitley, Richard Lawson, James Pickens Jr., Vanessa Williams and many more! I attended T-Boz's Unplugged charity event back in January which was created to raise awareness and funds for Sickle Cell Disease for which T-Boz is an Ambassador and Role Model for. 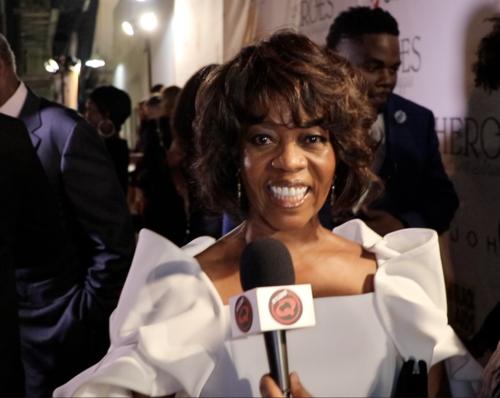 I spoke to Naughty by Nature, Dawnn Lewis, Kristian Alfonso, Dorien Wilson, Don Benjamin, Lamon Archey, Tonya Banks and T-Boz's daughter Chase on the red carpet before the show. They were all eager and excited to come out and support such a worthy cause. This was my first time at the Avalon Hollywood and I absolutely loved the ambience. The show was so much fun and featured incredible performances from Snoop Dogg, Da Brat, Naughty by Nature and T-Boz who also sang 'Unpretty' with her daughter Chase. Funds from the event will support The MLK Sickle Cell Outreach Center of Los Angeles and The Sickle Cell Support Group of Atlanta. Check out my red carpet interviews below. 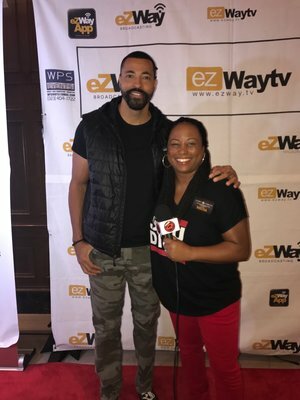 In October I had a great time interviewing Joy Rovaris who starred as Bobbi Kristina and Nadji Jeter who played Nick Gordon from TV One's movie, Bobbi Kristina. The story delves into Bobbi Kristina's struggle to come to terms with her mother's sudden departure as well as the complexities of her own life. Opposite Joy Rovaris, Bobbi Kristina stars Demetria McKinney who embodies the heart, flair and essence of the legendary Whitney Houston. The film also stars Hassan Johnson as Bobby Brown, and Vivica A. Fox as Pat Houston. 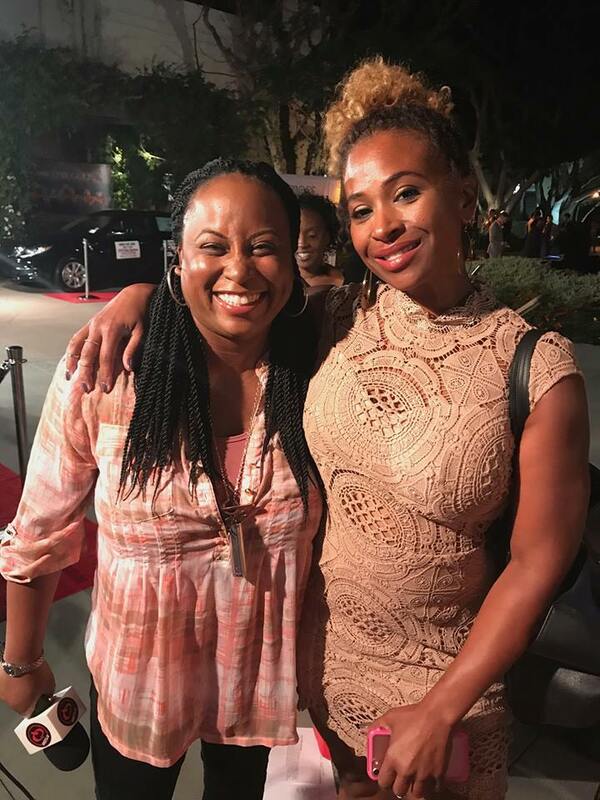 It was directed by child actor Ty Hodges and Executive Produced by Tracey Baker Simmons and Wanda Shelley, who were the creators of the docu-series Being Bobby Brown and The Houstons. Check out my Studio Q interview below. 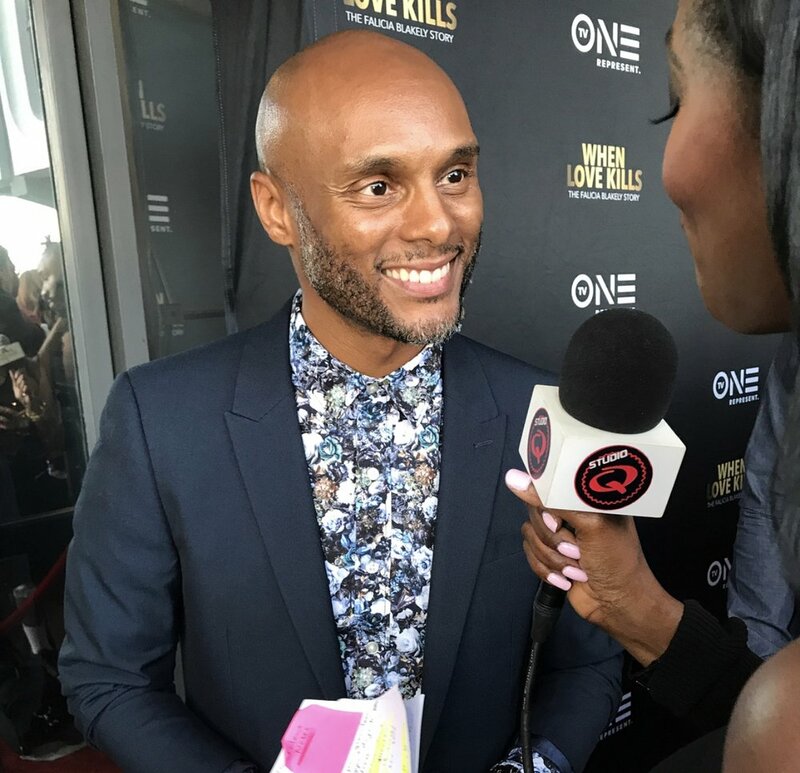 The Los Angeles premiere of the TV One movie, When Love Kills at the Harmony Gold Theater was the first event that I was actually absent for in 2017. I was so lucky that my producer Tam and friend Tammi were able to cover for me on the red carpet. They both did a great job! When Love Kills tells the tragic story of Falicia Blakely, a teen mom who only knows life in the fast-lane. When she becomes an exotic dancer, she attracts the attention of pimp and predator, Dino. His empty promises of a life together turn Falicia into a pawn in his dangerous games; she's forced to prove her love for him at the expense of innocent lives. 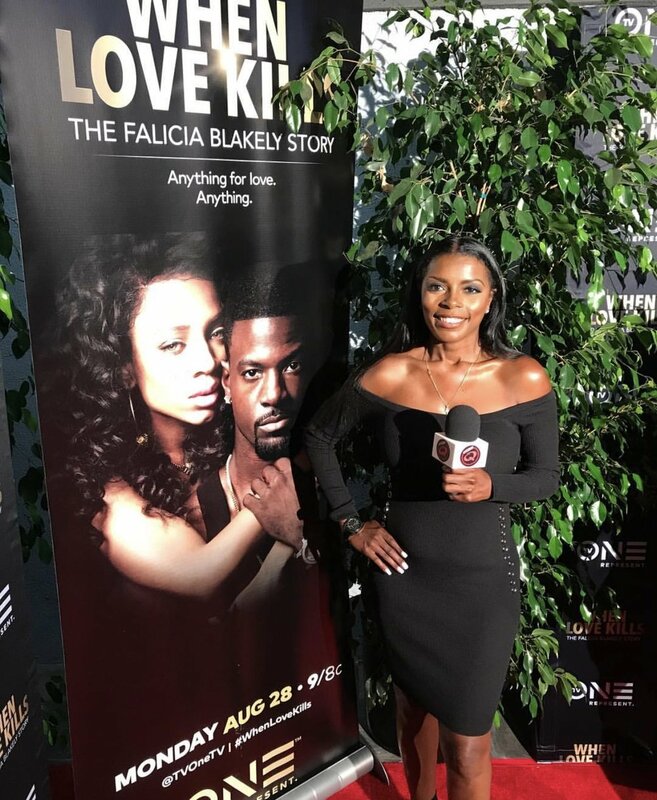 When Love Kills stars: Niatia "Lil Mama" Kirkland (CrazySexyCool: The TLC Story), Lance Gross (House of Payne, Temptation), Tami Roman (Basketball Wives, Belle's) and Tasha Smith (For Better Or Worse, Empire) making her feature-length directorial debut. Check out the Studio Q red carpet interviews below. I sat down with comedian Maronzio Vance and discussed his co-starring role on the 2nd season of George Lopez's show "Lopez" which premiered in March on TV Land. Maronzio Vance is a writer, actor, and comedian noted for his comedic timing in his roles for television shows. Vance began his acting career with roles in the series "JKX: The Jamie Kennedy Experiment" (WB, 2001-04) and "Wanda Does It" (2004-05). He also appeared on the television special "Jamie Foxx's Laffapalooza" (2004-07) which he talked about in our Studio Q interview. Maronzio continued his comedic performances throughout the early 2000s and the 2010s, appearing on"The Half Hour" (Comedy Central, 2011-15) and "Enlisted" (Fox, 2013-14). He also lent his voice to "Freaknik: The Musical" (Cartoon Network, 2009-2010). This guy had me in stitches during most of the interview. We covered so many topics including, his beef with Diddy and Bossip, Donald Trump, Hillary Clinton, why he hates Stay Woke and AF, and Lil Yachty appearing on an episode of "Lopez" this season. And all of it was funny. If you have never heard of Maronzio Vance before now, watch my interview below and I promise you won't ever forget him. His perspective on the world is smart and funny. Press play below and see what I mean. In November of this year, I sat down with 3 time Grammy-nominated singer, songwriter and producer, B. Slade (Formerly known as Tonex). He recently dropped his self-titled album, "B. Slade" on October 31st. This new album embodies all of the colorful characteristics that are within B. Slade, hence the name of one of his song titles, Ketchup & Mustard." This album is truly for the young and old, the hip and chic - for anyone who loves good music and wants to have a good time. Aside from his music, we discussed his sexuality, his family, the controversial interview with gospel singer, Lexi Allen, and starting over in his career. This is an interview you don't want to miss. Press play below! Afterwards head over to, BSladenow.com and download his new album, "B. Slade" on iTunes. 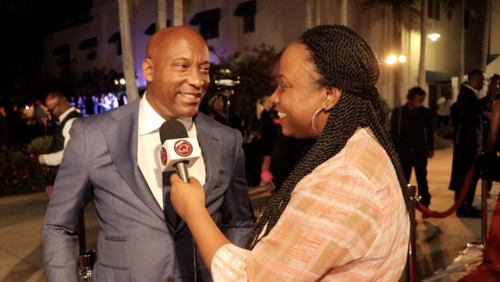 I was excited and honored to interview Don B. Welch just days before the film adaptation of his popular inspirational stage play, The Lost Souls Café premiered on TV One. We covered so many topics in our conversation that if you never met him you will really feel like you know him after watching. He was oozing with positivity and dripping with wisdom. For those of you who may be unaware, Don B. Welch is an accomplished singer, actor, writer, director, playwright, producer and author. As a playwright, he has written and directed over 27 productions. The most successful being: The Bachelor Party, The Bachelorette Party, My Brothers Keeper, The Divorce and Fight Club. Noted artists such as: Loretta Devine, Lynn Whitfield, Vanessa Bell Calloway, Dorien Wilson, Marla Gibbs, Ledisi, Kenny Lattimore, Dawnn Lewis, Jackee Harry, Freda Payne, Mary Wilson, Ananda Lewis, Flex Alexander, Shanice Wilson, Ellia English, Ginuwine, Malinda Williams, Keith Robinson, Darius McCrary, Carl Payne, Keith Robinson, Ernest L. Thomas, Judy Pace, Tatyana Ali & Essence Atkins have all been in a Don B. Welch production or film. Press Play and enjoy my conversation with Don B. Welch. On Saturday, March 18, 2017, I attended The Mayor's Masked Ball at the JW Marriott at LA LIVE in Los Angeles, CA. This is one of the largest events put on by UNCF in cities across the United States on the same evening. The LA chapter was hosted by Mayor Garcetti and honored Lonnie G. Bunch III, Founding Director of the Smithsonian National Museum of African American History and Culture and Marx Cazenave a well-known entrepreneur and business Hall of Fame inductee. The ball raised $500,000 for UNCF. Attendees included: Mayor Eric Garcetti, Lonnie G. Bunch III (Founding Director of the Smithsonian National Museum of African American History and Culture), Marx Cazenave (Entrepreneur ), Salli Richardson-Whitfield (I am Legend, Eureka), Michael Jai White (Why Did I Get Married), Laura Govan (Basketball Wives), Dawnn Lewis (Actress & singer), Tiffany Hines (Nikkita, Devious Maids), Lisa Nicole Cloud (Bravo TV's Married to Medicine), T’Keyah Crystal Keymah (In Living Color, That's So Raven), James Wright (WE tv’s “LA Hair”) and Darius McCrary (Next Day Air, Family Matters). Check out my Studio Q interviews from the Mayor's Masked Ball event below. 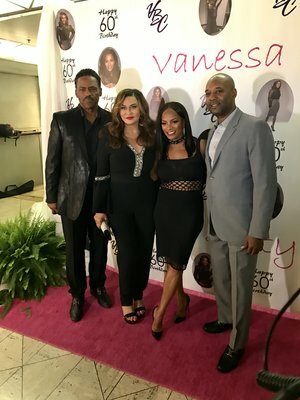 This year I attended the the Celebrity Connected Luxury Gifting Suite honoring the Emmys, The Oscars and The MTV Movie and TV awards. 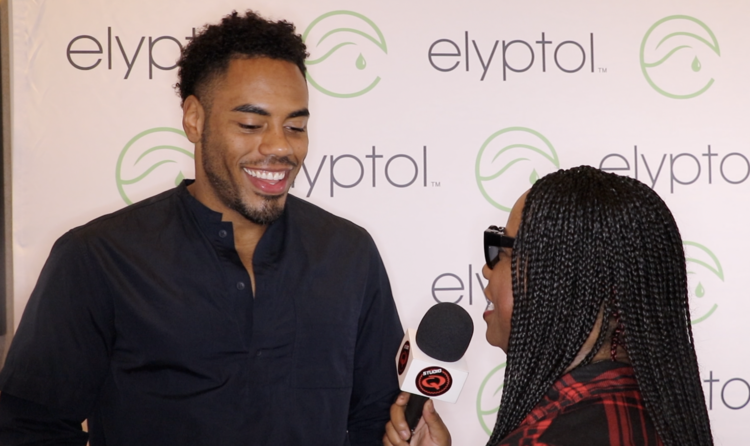 I always have a blast at these events interviewing celebrities and discovering awesome new brands. Press play and check out some of my Studio Q coverage below. On Sunday September 24, 2017, I covered the 2nd Annual Breaking the Silence Awards Ceremony & Luncheon held at the Fairmont Miramar Hotel & Bungalow in Santa Monica, CA. Breaking the Silence Awards (BTSA) a fundraiser event, which recognized corporations and community leaders who use their platform of influence to advocate for Sexual & Domestic Abuse Awareness. BTSA raises funds to provide supportive services to GLBT survivors of sexual & domestic abuse. 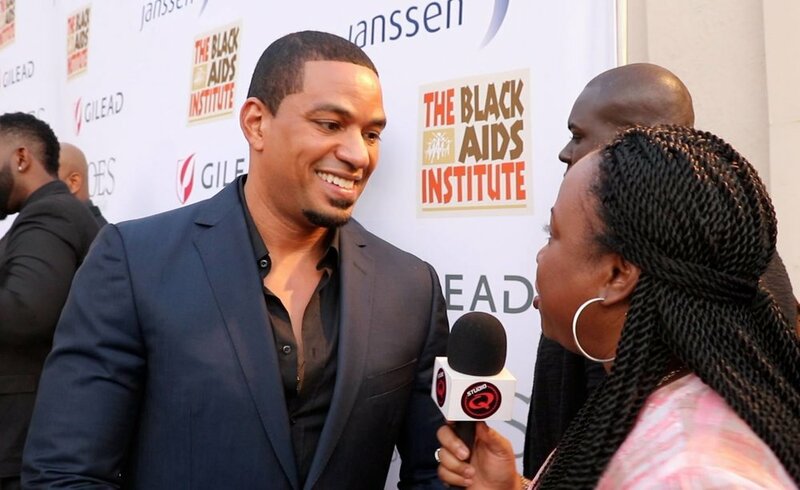 BTSA, a fundraising program of the I Love Me Foundation (ILMFDN), was established in 2015 by Hollywood publicist, Robert Harrell, to utilize the industry’s resources to engage the public in supporting new research efforts and to increase awareness about sexual trauma in the GLBT community. Honorees included: William Institute Founding Executive Director, Brad Sears, Former West Hollywood Mayor, Abbe Land, OUT Magazine Managing Editor, R. Kurt Osenlund, Celebrity DJ & Music Producer, Zeke Thomas, Pulse Orlando Nightclub Shooting Survivor, Angel Colon. 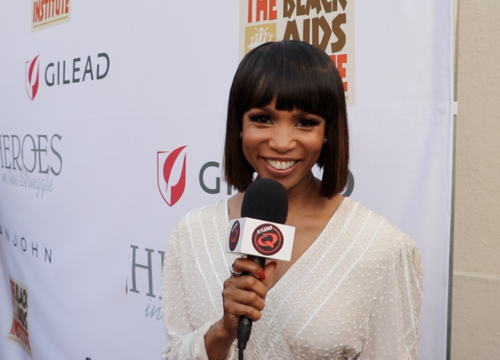 Other guests included: Benjamin Patterson (OWN 'Greenleaf'), Jay Alexander (ANTM), Laith Ashley (NBC 'Strut'), Leeza Gibbons (Entertainment Tonight), James Wright Chanel (Youtube Personality, Pattie Pie Guy), Perez Hilton (Entertainment Blogger), Tammy Townsend (Disney 'K.C. Undercover'), Laura Govan (Basketball Wives LA) and many more. 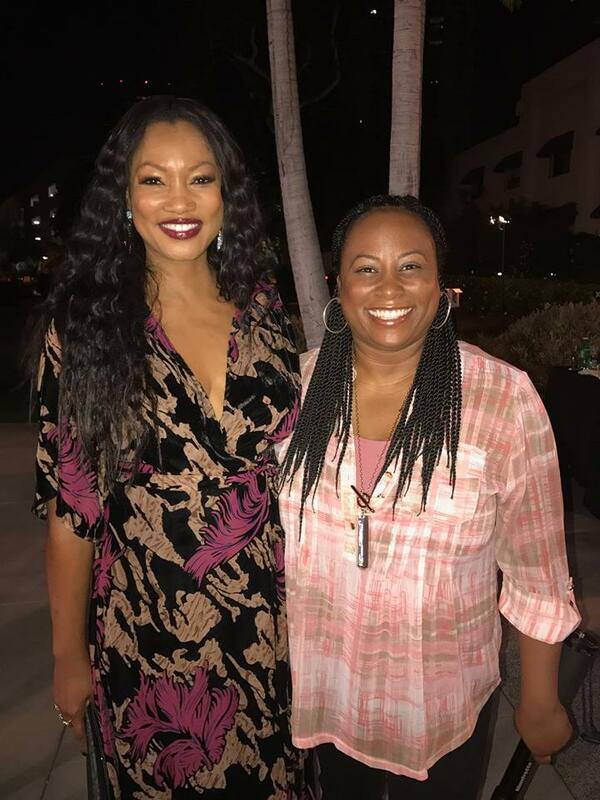 In May I did a Skype interview with actress Kyanna Simone Simpson who played the younger version of Oprah Winfrey's character in the biopic surrounding Henrietta Lacks life called The Immortal Life of Henrietta Lacks on HBO. The film tells the true story of Henrietta Lacks, an African-American woman whose cells were used to create the first immortal human cell line. Told through the eyes of her daughter, Deborah Lacks (Oprah Winfrey), the film chronicles her search to learn about the mother she never knew and to understand how the unauthorized harvesting of Lacks’ cancerous cells in 1951 led to unprecedented medical breakthroughs, changing countless lives and the face of medicine forever. 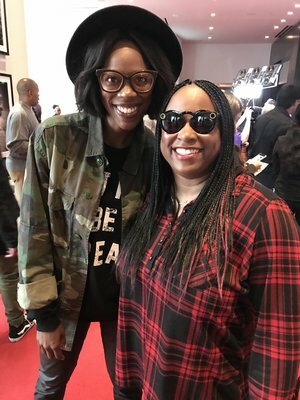 I had so much fun talking to Kyanna about her career, her mentor Latanya Richardson Jackson and what it was like to meet and work with Oprah Winfrey, which was a dream come true for her. This budding actress who is known for her recurring role on HBO’s miniseries Show Me a Hero is currently working on the film, White Boy Rick starring Matthew McConaughey. Check out our fun conversation below. In April I had such an amazing time interviewing Ashley Jones of Ashley Ann’s Events on Skype for Studio Q. She is a talented award winning wedding and event designer who is a rockstar in her field. You can find this late night biz builder @KingAshleyAnn sharing free social media tips to thousands of people every Monday - Thursday at 11:05 pm (CST) on the live-streaming Twitter app called Periscope. She is a social media genie who has been in business for 11 years and is quipped with a B.A. in Finance and M.B.A. Ashley has made a name for herself by offering beautiful, unique, professional designs and productions. She inspires creative detail, and modern, elegant atmospheres. She is also an outstanding business woman excelling in social media lead generations, lead magnets, funnels, and return paths. In my conversation with Ashley, we discussed business, social media, her overcoming amazing personal obstacles in her life and so much more! If you somehow missed this conversation in 2017 do yourself a favor and press play below. Thanks to all of the celebrities who I sat down with this year and talked to on the red carpet. And a special thanks to my producer Tam for all that she has done in the name of Studio Q.
I could not have covered all of these amazing events and conduct these awesome interviews without her. She's been there for me since 2012 and I will forever appreciate and be eternally grateful for every contribution she has ever made for Studio Q.
I'd also like to send a special shout out to anyone who has supported me online by pressing play on one of my interviews (Thanks Mom! ), clicking like or share on Facebook, retweeting my interviews on Twitter or tapping the heart button on Instagram. Thank you, Thank you, Thank you! I appreciate your support and I look forward to bringing you even more in 2018! Yesterday, I had a great time interviewing some of the cast from the upcoming TV One movie, Bobbi Kristina, premiering on TV One Sunday, October 8th at 7 p.m. ET/6 p.m. CT. Joy Rovaris stars as Bobbi Kristina and Nadji Jeter plays Nick Gordon. The story delves into Bobbi Kristina's struggle to come to terms with her mother's sudden departure as well as the complexities of her own life. Opposite Joy Rovaris, Bobbi Kristina stars Demetria McKinney who embodies the heart, flair and essence of the legendary Whitney Houston. The film also stars Hassan Johnson as Bobby Brown, and Vivica A. Fox as Pat Houston. It is directed by child actor Ty Hodges and Executive Produced by Tracey Baker Simmons and Wanda Shelley, who were the creators of the docu-series Being Bobby Brown and The Houstons. If you are a Whitney Houston fan, some of you might be put off by a movie about her daughter only two years after her passing. Krissi's father, Bobby Brown and The Whitney Houston estate even sued to try and stop this movie from being aired. But I say give it a chance, because this film really aims to share Bobbi Kristina's story which was often overshadowed by her larger than life parents. Although I have not seen the film, I did get a look at a 10 minute trailer which really impressed me. The acting was great and I was eager to see more. What I loved most about this cast is that they are all Whitney Houston fans and would not be a part of something that bashed Bobbi Kristina. I will definitely be watching on Sunday.